Install SharePoint 2013 Preview Prerequisites Offline. This article shows where you can get the correct installers and how to proceed for an offline installation. I tried to install SharePoint 2013 Preview in a VM that didn’t have any connectivity to the internet, and you know what happened? I got errors that blocked the installation, resulting in an installation failure. Then I decided to download the prerequisites manually as a workaround, which I recommend, specially if you are going to use AutoSPInstaller (there is no updated version of this installer for SharePoint 2013 at the moment, this is in progress). 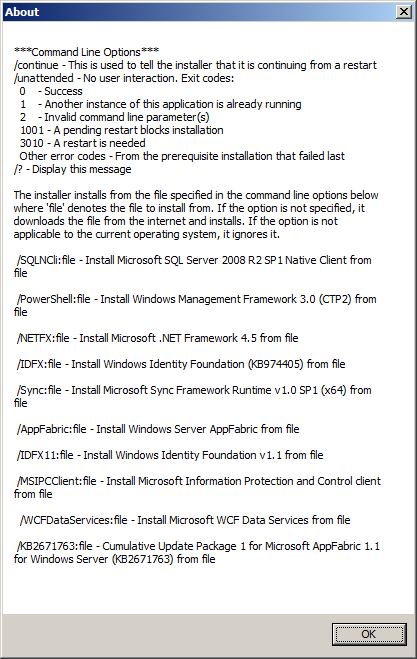 After downloading the installers above, I simply added them to the SharePoint prerequisiteinstallerfiles folder, then executed the SharePoint installer and again, an attempt to download the packages from the internet resulted in error. I was expecting the installer to pick the prerequisite installers automatically, but it didn’t happen. Well, my choice was to install the packages using the command line for an offline installation. Or you can create an arguments file and save it to the same directory where the prerequisiteinstaller.exe is (which is in the root of the SharePoint 2013 Preview image).